Discussion in 'Linguistics' started by Athelwulf, Mar 21, 2007. What does it say here ?. No one answered my question about what this writing on the tiger means . I think this is not Arabic and then what do I really know ?!.....Loool . And no, I don't know what that says either. Or if its Arabic or Persian. i would like to learn more about the english language because my studying is based on it . 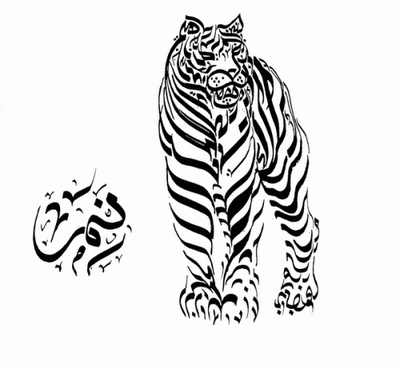 Can you tell us what the writings say on the tiger.....etc ?. Some arabic letters look like variations of Hebrew letters rotated or shrunk. If there was a Hebrew - Arabic lexicon I'd have an easier time. and in the right side they wrote the name of god "al-basmla"
Both were derived from the Phoenician alphabet (technically an abjad because it didn't have vowels) and ultimately from the proto-Canaan, so the similarity is natural. Even the names of some of the letters are almost the same: alif/aleph dal/daledh gim/gimel sin/sin qaf/qof gayn/ghayin lam/lamedh mim/mem nun/nun waw/waw. Took me a while to look it up, but I think this is the closest one I can find about the tiger. It's a prayer known as Naady Ali (Call upon Ali), very famous among Shi'ah Muslim and most likely the artist is Persian. (All) worries and sorrows will soon disappear . O Ali! O Ali! O Ali! Rabbanaa laa tu-aa-khiznaaa 'inna siinaa 'aw 'akhta'-naa. - Our Lord! Condemn us not if we forget, or miss the mark! Rabbanaa wa laa tahmil 'alay-naa 'is-ran-kamaa hamal-tahuu 'alal-ladziina min-qab-linaa. - Our Lord! Lay not on us such a burden as thou didst lay on those before us! Rabbanaa wa laa tuhammil-naa maa laa taaqata lanaa bih. - Our Lord! Impose not on us that which we have not the strength to bear! Wa'-fu 'annaa, Wagh-fir lanaa, war-ham-naa. - Thou, our Protector, and give us victory over the disbelieving folk. Have no idea what the feet read. Hebrew is a language of scholarship in Western civilization because of its relevance to the roots of the Abrahamic religions, although it runs a distant fifth in that role to Latin, Greek, French and German. Many of us know the abjad and the vowel marks, can read it aloud, and have vocabularies in the 3-5 range on my powers-of-three scale (30-300 words). I can recite Hebrew in the classical pronunciation from when it was first a living language, but the phonetics of modern Israeli Hebrew, streamlined during its long service as a liturgical language in the mouths of people who spoke Aramaic and, later, European languages, are not familiar to me. When I sing folk songs like "Havah Nagila" with extra syllables and forgotten sounds like TH, it makes people cringe. Arabic, on the other hand, is not a popular study among Westerners. Even though it is the world's sixth language with two hundred million speakers--more than Portuguese and on a par with Bengali--and despite its obvious political, military and economic importance, it is only the ninth most popular foreign language in America's schools, with a pitiful contingent of six thousand students nationwide in the last report I saw. The U.S. government has a critical shortage of Arabic translators and interpreters. After 9/11 it took them about five years to catch up with all of the Arabic language documents in their in-basket, during which time they were biting their nails, hoping not to find a PowerPoint presentation of the complete details of the attacks (they did not). This deficit is exacerbated by the muy macho military's recent policy of firing an enormous portion of their staff of language experts who--for demographic reasons as yet unexplained--happened to be gay. If you want your kids to have a nice career path, urge them to major in Arabic or some other important Middle Eastern language like Farsi or Urdu. Obama has sworn to overturn the anti-gay policy so even if they're gay it should not be a problem. Egypt alone has a population of 80 millions. Palestinians are about 10 millions worldwide. The Arabian peninsula has no less than 50 million native speakers. Iran has 5 million native Arabic speakers. Arabic is also spoken natively by millions in Sub-Saharan Africa, the African Horn, and Turkey. Millions of native Arabic speakers live in diaspora. I don't know where the 200 million number came from, but native Arabic speakers worldwide are approaching 400 millions if not more. Encarta says that Arabic is the second most wildly spoken native language after Chinese, and this is a more logical estimate.